Time flies when you’re having fun (obviously) and the same has to be said for the girls behind one of the most enduring pop outfits in the world. Bananarama is this year celebrating their 30th Anniversary in the business. 30 long years since their first single ‘T’ain’t What You Do (It’s the Way That You Do It)’ kicked off a stellar run of chart success that spawned smash singles including ‘Shy Boy’, ‘I Heard A Rumour’, ‘Cruel Summer’, ‘I Want You Back’, ‘Venus’ and ‘Love In The First Degree’. To celebrate this impending milestone, the band (which now consists solely of Keren and Sara) is releasing a brand new compilation album – an anthology, if you will – of their extraordinary 30 years. Brilliantly for fans, the release will also include a DVD of all 35 video clips – the first time Bananarama has released a DVD collection of their official videos. 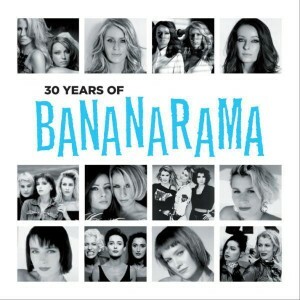 No word on an Australian release just yet, but ’30 Years Of Bananarama’ will hit the UK on Monday July 09.
as well as the key hits, you’ve got a pretty hefty sized video clip collection, quite similar in size to the above Bananarama tracklisting. Don’t take this the wrong way, but when it comes to Cyndi Lauper, I know what I’m talking about! Anonymous, I am well aware of Cyndi Lauper’s (and Bananarama’s) countless compilations – it’s the complete DVD that I, and many other Bananarama fans will be salivating over – and this is what I was alluding to when mentioning Cyndi Lauper’s name. A complete video collection on DVD is well and truly overdue in both Bananarama and Cyndi Lauper’s cases. Ian – Cyndi Lauper has released many GH collections, although admittedly, the video anthology only covers material up to 1994 (she hasn’t filmed many videos since then, though – only “Into The Nightlife” comes to mind). There’s a box set that contains pretty much every single she ever released (and many album tracks). I bought it here around eight years ago. As for Bananarama, this is very exciting news! I wish the CD contained all of the tracks that feature on the DVD, though! Is it possible to rip audio from a DVD for playing in iTunes…? Best news to wake up to on a cold Saturday morning, I’m literally gushing now! Strange though that it doesn’t feature “It Ain’t What you Do”!!! Long overdue and most welcome! Now if only a few other artists could follow in these steps… Ms Lauper?! ?